Today, we shall take a walk down another beautiful landscaped garden with equally majestic buildings. Ipoh is rich in colonial history. At the turn of the 20th century, Ipoh was famous for its rich tin deposits and tin mines where vast fortunes were made, hence earning it the nickname, "the town built on tin" or "the city of millionnaires". Today, other nicknames has been added and this include "bougainvillea city" and "hill city". It is also famous for the wide variety or delicious food and "white coffee". This is the Railway Station. Designed by Arthur Benison Hubback who was the British Architectural Assistant to the Director of Public Works at that time, this building was completed in 1917. Built according to "British Raj Moghul" style, the moorish domes and turrets led to its nickname "The Taj Mahal of Ipoh". Today, this railway station also houses the Majestic Station Hotel. In front of this building, there is a beautifully landscaped bougainvillea garden complete with a war memorial and an arched walkway. Here, there are swaying palms and rows of manicured shrubs, ixoras and bougainvilleas. The big tall tree is the Ipoh / Epu / Upas /Tree (Antiaris Toxicarial). It was found abundantly around town a very long time ago during the days when Ipoh was discovered. That was how Ipoh got its name. This tree can grow up to a hundred feet tall. The indigenous people used its sap to make poisonous darts for their blowpipes. There is a signboard with explanatory notes next to the tree within the enclosed area. Now, I will turn around in a clockwise direction and snap some pictures. The first picture above shows some evergreen trees (junipers?) growing slanted in a certain direction. Is it caused by the wind or do they usually grow like this? Well, I don't know. This picture shows the Ipoh Town Hall building. Beautiful, isn't it? As usual, there are rows of bougainvilleas on both sides of the building. This building which was also designed by AR Hubback was completed in 1917. Notice the mix of renaissance and roman architectural features incorporated into the building. It has served as a post office and district police headquarters in the past. This white building is a delight for many amateur photographers wishing to take snapshots for photgraphy contests. The Police Contingent Head Quarters of Perak is at the background, partly hidden by the arches. If you click on the photo, you'll be able to see more clearly. See the luscious lawn, ixoras, and bougainvilleas? I think we can sit or roll on the ground and take some hollywood/bollywood style pictures here. More bougainvilleas and beautiful scenery for 'modelling' and posing for photographs or perhaps shoot some MTVs. The white building at the background is actually the post office. If you walk down the road in front of this railway station, you will be able to see more colonial styled buildings. I have not included it here as I wish to keep to the garden theme and not deviate. In fact, this was one of the site selected for location shooting of the remake of the Hollywood film "Anna and The King" staring Jodie Foster. Sam Poh Tong, when translated means The Tripple Gems Cave. Some like to call it The Cavern of Tripple Gems. Discovered in 1890 by a monk from China, this Chinese Buddhist temple was built within a natural limestone hill and managed by monks and nuns. 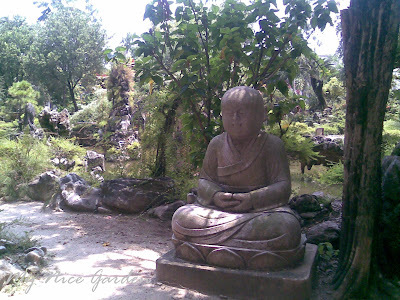 Inside the cavern, there are beautiful Buddha statues, natural stalactite and stalagmite formations and a tortoise pond. There is also vegetarian food and a columbarium here. 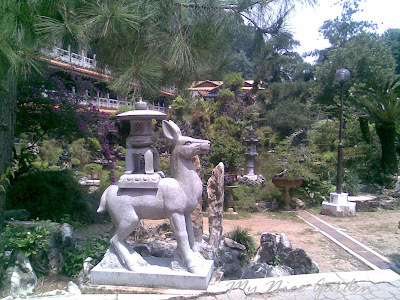 At the entrance to this temple, towards the right hand side, there is a beautiful oriental garden. 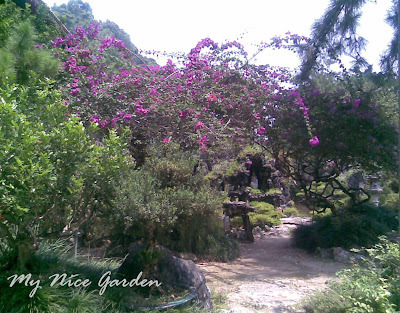 This garden was awarded "The Best Landscaped Garden in Malaysia" in 1993. 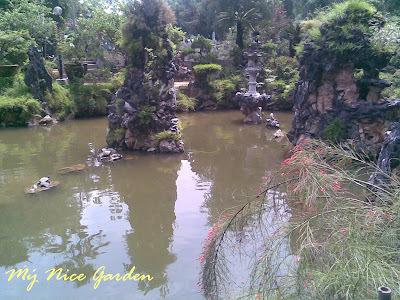 It was a big tourist attraction with its picture perfect views, variety of well-kept plants and fish pond. This man-made masterpiece is a photograher's paradise. This feng shui garden has a spectacular view against the backdrop of a tropical rainforest. 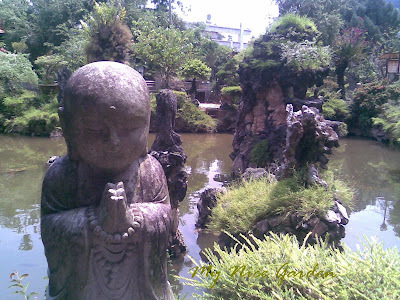 The chinese word for landscaped garden is "shan shui", meaning mountain and water. 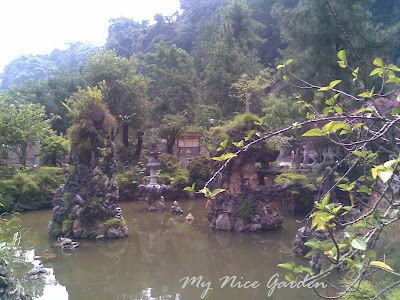 Like any typical chinese rock garden, there is the rock-shaped mounds, bridges, pavillions and a pond with gold fish and carps. Amidst cool and quiet surroundings, plants and rock formations provide the scenic beauty while fishes and tortoises add life to the garden. Click on the picture and you can find 2 stone fishes beside the stone lamp in the pond. There is a triangular shaped rock in the centre of the pond. Can you see some tortoises here? They are real. Sam Poh Tong is also famous for the 'live-in' tortoises. Tortoises symbolise longevity. A beautiful pavilion leads to the garden. There is a meandering path along the way lined by stone chairs and benches where one can sit down and take a rest while enjoying the spectacular view. This is a beautifully carved stone lamp on an ancient mythical creature. Is that a pine tree above ? 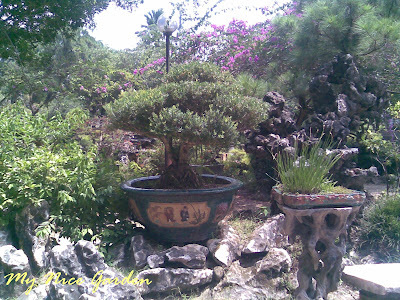 An oriental garden is never complete without the pines, bamboo and bonsai. Pines symbolise longevity, persistence and wisdom. 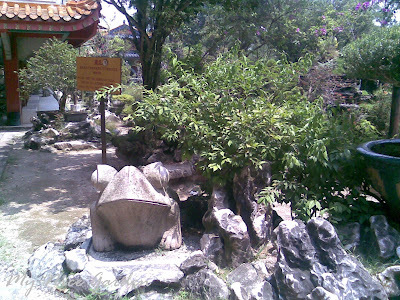 This stone toad is basking under the yang energy of the sun during the day and yin energy of the moon at night. I hope that it will come alive after dark to catch or frighten away all the blood-sucking and disease carrying mosquitoes. Can you see a large chinese pavillion in the background? That's the place visitors love to sit, relax and enjoy the scenic views. Here's a bonsai on a giant ceramic pot with auspicious pictures and writings. 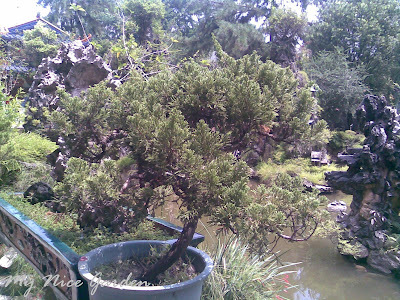 Bonsai is a symbol of peace and harmony. It was originally planted in monasteries. Look at the beautiful rock formations. Can you see a tall pink bougainvillea shrub in the background? The rock towers from another angle. Now, more tortoises have joint their friends. They seem to be sunbathing here. There are also carps and other fishes in this pond. Ancient rock gardens were mostly designed for scholars. It was a place for the learned to connect with nature, providing a calm and tranquil setting for quiet contemplation, medidation and spiritual stimulation. It is where they find inspiration for expression in poetry, art painting and calligraphy. Another bonsai, perhaps a pine tree? Little Buddha with a welcome gesture? A monk in medidation here? This is the picture that I like most. A little kid taking a nap. So chubby and cute. Gives me the happy and contended feeling. 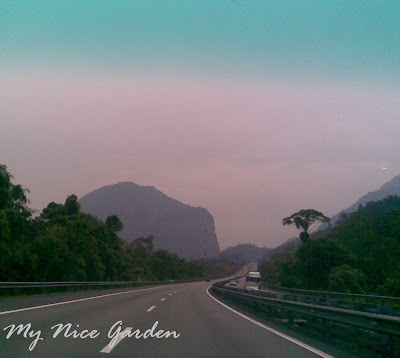 Ipoh is situated in Kinta Valley, sandwiched between the mountain ranges of Keledang and Titiwangsa. I always look forward to this magnificient view of great limestone hills as we are reaching this former tin-mining town. On the way, we passed by Gunung Rapat area and decided to make a quick stopover at some famous cave temples of Ipoh as we had half an hour to spare. All these cave temples are built within natural rock formations and are places of worship for Buddhist and Taoist devotees. There are at least 3 cave temples along the same road. This is Ling Sen Tong Temple or Cave of the Goddess of Providence. Please click on the picture for an enlarged view. Can you see the big forrested limestone hill at the back of the temple? The entrance to this temple is flanked by 2 dragons, 2 mythical lions and 2 Door Gods. Upon entry, you will be greeted by the God of Prosperity. Together with the golden toad, they bring wealth. The golden toad is sitting on plenty of gold ingots and the God of Prosperity is holding some too. 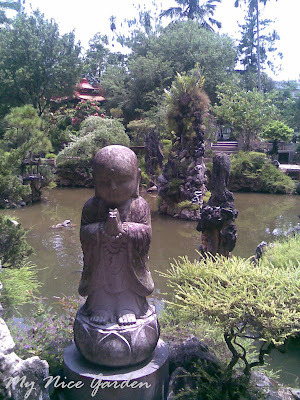 There are also statues of the Buddha, Master Xuan Zang (a Tang Dynasty monk), the Monkey King, God of Longevity, dragons and other mytical figures and deities. When you click on the picture, you will see a lady lighting up some joss sticks to pray. The hanging coiled shaped incense are used to pray for 'special request' e.g. health, studies, marriage, safety, business, etc. There is a pink cardboard paper hanging from each coil. The name of the devotee will be written on this paper. It's like a message/memo ID. Notice also the two dragons coiled around the two pillars. This is the giant statue of Guan Yin or Goddess of Mercy. Can you see the blooming bougainvillea plant? There are palms, ferns, potted bougainvilleas and alamandas everywhere too. In front of Guan Yin, there are 3 giant joss sticks. A gentleman is praying to her admist the tranquil surroundings of a limestone rainforest. Can you see the golden statues of the Four Heavenly Kings on the rooftop? They are the Guardians of the Four Compass Directions, also known as Four Deva Warriors, Four Lords of Dhamma and Four Keepers of the World. Here, you can find 3 white elephants and a couple praying to Buddha. The next in line is Nan Thean Tong Temple or Cave of Southern Heaven. 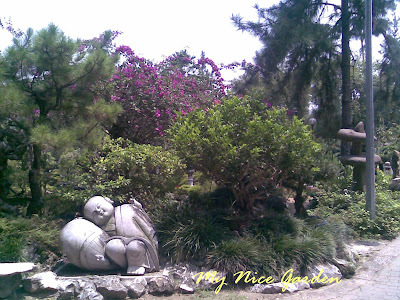 On the temple grounds, there is a beautiful landscaped garden and pond with fishes and tortoises. Beautiful stalactite and stalagmite formations can be found inside the temple. This temple was founded in 1867. Finally, this is Sam Poh Tong Temple or Cave of Tripple Gems. There is a beautiful and award winning, landscaped garden here. My next post will be on this garden. The bougainvillea is a thorny, woody vine that is native to South America. It was first discovered in 1768 by a French botanist, Philbert Commerson who named it after his friend Louis A. de Bougainville, a captain, matematician and explorer from Canada. It is the national flower of Guam and the official flower of Ipoh, Malaysia. In Malay language, we call it 'bunga kertas' meaning paper flowers. 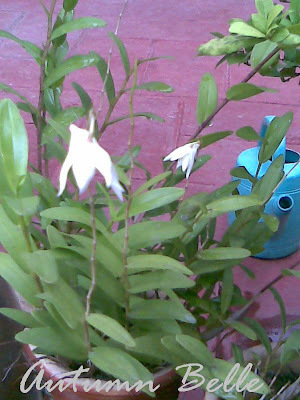 The actual flower of the plant is small and usually white in colour. Each cluster-of-three flower is sourrounded by 3 to 6 bracts which are brightly coloured. So, we can have a pink, white, purple, red, orange, yellow or magenta bougainvillea plant. Bougainvilleas are flowering evergreens that can be planted in many ways; e.g. as ornamental plants or bonsai plants in containers, as shrubs and hedges or to decorate pergolas, trelis, patio, decks and balconies. You can see bougainvillea of many colours being used to decorate the balconies of resorts, living apartments and even hospitals. They really look nice with cascading stems and flowers dropping from balconies and walls, especially when they bloom in a myriad of bright colours. If you select 2 bougainvillea plants of different colours and plant them together in the same pot, you will get this effect. Ain't this combinition pretty? Think of the many colour combinations that you can try out. 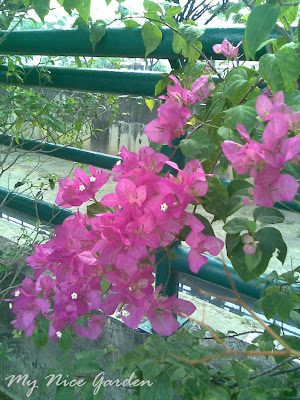 This bougainvillea shrub has grown quite tall and is flowering profusely. It adds colour to the rock garden below. Bougainvilleas are actually very easy to grow. They love the sun in our equatorial tropics. The seedlings can be purchased from nurseries at a cheap price. Some cultivars do not have thorns. Use well drain soil. They are almost pest free and require minimum care. Mine had been with me for more than 10 years, has never been repotted and it is still flowering. It can withstand long periods of neglect. Just that if you don't look after it well, there won't be much flowers but it won't die so easily. From my personal experience, if you water it very frequently, it will grow more stems and leaves at the expense of flowers. To encourage flowering, water less or just enough and apply fertilizer. The flower cycle can last from 4 to 6 weeks. After the flowers have withered, cut off the dead ends or maybe give the plant a good trim. Do this to reshape the plant and encourage new growth. Cape Honeysuckle (Tecoma Capensis) is a sun-loving shrub that is very easy to grow. The flowers are tubular shaped and brightly coloured. What I have here is cultivar 'salmon'. It was already flowering when I first bought it at our local nursery for a meagre RM 5.00. Very cheap! What a small price to pay for the joy that it has given me. What I love about this plant is that once it starts blooming, it never seems to stop. I guess the flowers will be here all year round. Regularly watering and well drained to sandy soil. Pruning is recommended to reshape the plant and encourage more growth and flowers. This plant can take hard pruning. Plant it in a container if you have limited land for gardening because its roots may be quite invasive. I am very very happy lately. In fact, overjoyed that I have eventually found the name of a mysterious orchid in my garden. 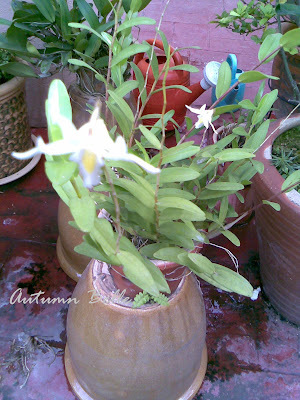 In this post, I have a story about this orchid; Dendrobium crumenatum or pigeon orchid. I would like to say thank you very much to Blogger Sunita of The Urban Gardener who wrote her latest post tittled, Monsoon Gifts. For it is through reading her wonderful post that I learnt the name of this orchid. This orchid had been my treasure all along. I'm sorry I couldn't take a better picture of it the last time it bloomed as I only had a handphone camera with me then. I found this orchid at my parents' home in Ipoh a day after dad's funeral. It looked dried up and dead with only one or two remaining green leaves. So, I took it home and tried to revive it. This orchid was mum's favourite. Unlike dad who had a green thumb, my mother hardly planted anything in the garden, except for the aloe vera and this orchid. She loved cooking instead. Frankly speaking, I really do not know what is the name of this plant or what type of flowers it will bear. I can only say that it looked like an orchid. Mum did tell me about the plant when she was alive, like what the name was, who gave it to her and why she liked it. In fact, she wanted to give it to me. That was many years ago. I didn't want it because I was already all stressed up with 2 young kids and a full time job. Whatever plants that existed in my garden just had to survive on its own. So I didn't take it home. Instead, I asked her to take care of it for me. Then I completely forgot about it. After mum passed away, I began to miss her very much; her gentle voice, her talks with me, her dishes, etc., etc. To keep her memory alive, I need to hold on to something living that she had left behind. Yes, a living plant. I regret that I didn't take it seriously. How can I forget? I thought I could ask her again and again as often as I liked. I didn't expect her to leave me forever at such an early age of 69. That was 5 years ago. After her death, dad took care of the plant until his death in early 2007. For 2 years, I tried my best to nurture this orchid based on my general knowledge and common sense. I do not like the feeling of not knowing all the details. But I didn't want to give up. I know my mum. When she gave me something, it was definitely very valuable and meaningful. So, I persisted. Somehow, it managed to grow again from a dying plant to a better looking plant. Now I have two of them, each plant with baby plants that can be propagated. It had bloomed twice but each time there were only one or two tiny white flowers that lasted only a few hours. Very dismal. I had expected beautiful brightly coloured flowers. It was a shock to me when I found that this orchid can in fact have many many flowers. And the flowers are shaped like pigeons or white doves. The flowers can be so many and so beautiful. It is only now that I can see the pigeon in the flower! Yes, today I know the botanical name. It is Dendrobium crumenatum orchid or pigeon orchid. Now, this plant is no longer a mystery. Knowing the name means a lot to me. It means that I can get as much information as I like from the many sources available. I want my dendrobium to have many blooms that looked like pigeons perching on a flower stalk, just like the one in Sunita's garden. It is amazing how 2 complete strangers can be connected in this way. Isn't it strange but wonderful? I have found the answer from someone who lives in a far away place. And I'm glad I did. For the link to Sunita's post: click here. The lemon grass plant grown in many parts of South East Asia. Here, we call it the serai plant in malay. Lemon grass is widely used in many Asian dishes, particulary Thai, Malaysian and Vietnamese cuisine. We cut away the top leafy portion and use only the lower section of the stem for cooking. It has a lemon scent and somewhat citrus-ginger taste. We use it to cook curry, tom yam soup, spicy seafood and even when we fry chicken. We can find this plant in almost every home, especialy in the countryside. Even if we don't grow lemon grass at home, we can easily buy it from the markets. When growing the lemon grass plant, it is better not to plant it directly on to the soil but to put the stems in a container of water and let it stand for a few days until roots start to form. After the outer dried leaves are removed, it will reveal some new shoots. Now, it is time to plant it in soil in a container or on the ground. It is very very easy to plant and there is hardly any problem with pests. I guess pests don't like the lemongrass smell. When the leaves gets too bushy, it should be trimmed down for a neater look. Because of this anti-cancer findings/news, there are many health enthusiasts who would DIY and take the homemade lemon grass drinks. Here, lemongass is finely chopped and steeped in a pot of hot water for an hour before drinking it. Some like to drink it chilled. I'm tempted to try this too. I really love the scent of lemon grass leaves. I'm thinking of making a potpourri using the leaves and chopping the lower part to make the health drink. After drinking lemon grass potion, I'll try to have a good night's sleep with lemon grass potpourri under my pillow. Perhaps I'll report the findings in another post. Portulaca Grandiflora, (Moss-rose Purslane or Moss-rose) is a small, fast growing and succulent flowering plant native to South America. It is also found here in the tropics in South East Asia. Cultivars come in a variety of colours such as red, pink, peach, yellow, white and orange, some having double flowers or extra petals. Fanciful names given include Radiance, Sundance, Sundial, Swanlake, Wildfire, Jumbo, Duet, etc. Portulaca Grandiflora is actually very easy to grow, doesn't really need much care and flowers easily, therefore I would recommend it to beginners to try out. Seing beautiful flowers from your own effort is definitely a very good motivating factor! This Portulaca Giant Bicolour flower has a mixture of pastel pink and white. I like it most. It looks as though it is hand painted using water colours. Flowers will look great on hanging baskets. You can mix a few plants together to create a colourful combo effect. Here it is sharing the same container with my pomelo plant, a 3-in-1 effect. Tequila Red- this is especially beautiful because it is red on the outside and yellow in the middle. Portulaca Grandiflora Sundial in shocking pink. Portulaca Grandiflora Radiance Red . 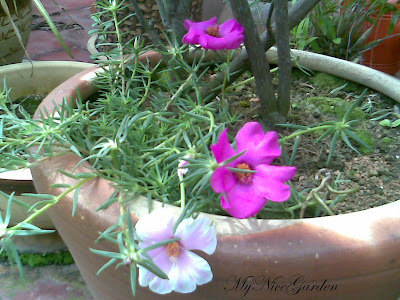 Here, it is sharing the same flower pot with my promegranate plant. You can grow from seeds or from seedlings purchased from nurseries. When portulaca hunting at nurseries, it is better to go in the morning. This is because the pretty flowers will open for a limited time only, i.e. in the morning just as the sun rises and slowly wither later in the day. During rainy or cloudy days where there is not enough sunlight, they will hardly open. If you leave for work before sunrise and come back in the late evenings, mabye you would not be able to see how the flowers look like. Or if you are a person who likes to sleep late and wake up late, then maybe you won't be able to enjoy the beauty of this flower. The plant prefer well-drained, sandy soil and the full sun. It can stand dry and hot conditions, therefore water sparingly. Just that, if the plant receives enough watering, there will be more flowers. The flowers last less than a day but will be replaced by other new ones. It is a good idea to remove dead flowers to encourage more blooms and for a neater look. 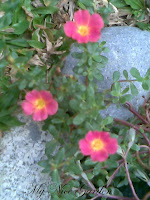 Portulaca can be used as a bedding plant, ground cover, in flower pots, containers, window boxes or hanging baskets. If planted in crevices, its beautiful little flowers will enhance rock gardens. It can also be planted together in 'combo' with other plants sharing the same container. In small containers, it can be used to decorate window ledges. Some people use it to replace grass on road shoulders. However, this plant cannot be stepped on. Aphids and root-rot nematodes are common problems. For aphids, use a stream of water or soapy spray to wash off these pests. If the problem is root-rot, there is not much to do except to give the infected plant a good send-off and plant a new one instead. I prefer the stem cuttings method. Just pluck off a portion of the stem and push it into the soil. Soon roots will form and shoots start to apear. So, just 'pluck and plant' and 'pluck and plant' and 'pluck and plant'..... Always remember! Never over-water the plant. Otherwise the roots will start to rot and the plants dies. THE END.